Our Pre-Ballet and Beginning Ballet instructors use a fun and imaginative syllabus to playfully introduce French ballet terminology, age-appropriate ballet technique, teamwork, self-discipline, and ballet etiquette. We explore motor skills and musicality while encouraging creative thinking and a spirit of fun in the arts! Our young dancers attain higher levels of self-confidence as they develop strength, flexibility, and coordination through the joy of dance. PRE-BALLET & PRIMARY CLASSES ARE HIGHLIGHTED IN PINK FONT. 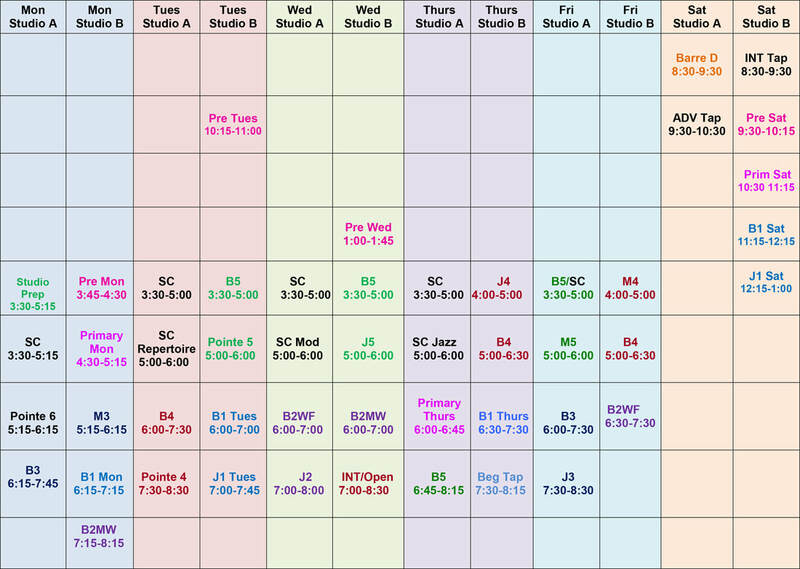 The "A" and "B" in the schedules below denote which studio the class will be held in. Studio A is the right of the elevator when you arrive on the 2nd floor of our studios. Studio B is to the left, and closer to the dressing room.